Mozilla launched Tracking Protection, a new feature to block trackers on the web automatically, in Firefox Nightly back in November 2014. The feature, turned off by default, needs to be enabled before it becomes available in the browser. To do so, load about:config in the browser's address bar and hit enter, and confirm that you will be careful. Search for privacy.trackingprotection.enabled and double-click the preference to set it to true to enable it in the browser. Tracking Protection is available as a feature in Firefox 35 and newer, and uses Disconnect's blocklist. Unlike ad-blockers or script-blockers, Tracking Protection blocks so-called trackers only. The core difference is that it won't block advertisement on web pages that you visit in Firefox but will block trackers that may be loaded on web pages to track you on the Internet. Trackers assign unique IDs to Internet users when they connect the first time to a web page that is loading trackers. Subsequent visits to the same or other pages that use the tracker use the ID to follow the user around on the Internet to create profiles that include interests, location-based information and information about the computer system and browser used. Firefox blocks these trackers when Tracking Protection is enabled in the browser. To be precise, Firefox blocks connections to known trackers only. This is done to prevent page loading issues in the browser as sites may depend on these scripts and may refuse to load fully or partially. While that is useful for privacy, as it improves it significantly, it is also beneficial when it comes to the loading time of websites you visit in the browser. A research paper by Georgios Kontaxis and Monica Chew came to the conclusion that Firefox's Tracking Protection feature improves page load time on average by 44%. In addition, it reduced the average data usage when connecting to the top 200 Alexa websites by 39%, and dropped the number if HTTP cookies by 67,5% on those sites. Tracking Protection blocked at least one tracking element on 99% of the top 200 Alexa sites, 11 tracking elements on 50% of the sites, and up to 150 trackers in at least one site. Tracking Protection improves privacy and page loading time without blocking advertisement. While some users may prefer to block ads as well, webmasters and online businesses will certainly appreciate the method especially if advertisement is the businesses sole revenue source. A research paper came to the conclusion that Firefox's Tracking Protection feature decreases page load times by 44% on the top 200 Alexa websites. Very nice feature, kind of hidden AdBlock, to be honest this feature will never affect Firefox, webmaster will never ban Firefox because it is very popular or they want to drop their website traffic. Blocking tracking scripts and tracking cookies has the side-effect of removing quite a lot of ads. Since more than a few ad providers now use some form of tracking in their advertisings, Firefox Tracking Protection will block these requests. It’s important to mention that privacy advocates are not at all against advertising, they just don’t want these ads planting trackings cookies on their computers too follow them around the web. That’s no less than an intrusion. So, this is Mozilla’s effort to help change how advertising is done and I think we would all benefit from less intrusive ads. If you install disconnect as an extension you should have the same effects? It is unclear if the list is identical to the one used by the Disconnect extension. If I had to guess, I’d say they are fairly similar or even identical but I could not find information about that online. Thanks Sören, really helpful link! I tried Disconnect (for social sites) and to horrible results. May too many sites have Google/Facebook/Twitter and other ones built in in the page. As result Disconnect cripples too many pages. I block social plugins through AdblockPlus, but my whitelist for them is mile long. What is the derivation of the word or name “shavar” ? Is it someone who works for Mozilla? Here, you can see the clientside code which plucks each hashsum from the retrieved list, creating a sqlite table row for each in the client-stored antitracking lookup table. nsUrlClassifierDBService to compare hashsum of each prospective destination URL — comparing against the hashes stored in the antitracking sqlite table. The longwinded description, above, is intended to represent that i know “what the hell I’m talking about”. Personally, I won’t use the antitracking feature and (see Monica’s blog) and I’m critical of the fact that this feature’s mechanism supports “browser sovereignty” __not__ “user sovereignty”. We mere mortals are not privy to the actual list content, nor are we empowered to customize the list entries. Geez, even MSIE supports user-customization of list entries in its analagous feature. Moreover, isn’t this –} https://github.com/mozilla-services/shavar-list-exceptions/blob/master/allow_list essentially an admission that, as currently implemented, the “antitracking feature” is fatally flawed? Hashsum representation was reputedly chosen (as part of safebrowsing API) “to enhance privacy”. That seems specious to me. If/when telemetry conveys, back to the telemetry server via https (or wss websocket stream), which prospective destinations have been blocked — nothing is gained/lost in terms of privacy by reporting hashsum IDs vs plaintext URLstrings. AFAICT, the sole benefit of storing hashsums is achieving smaller sqlite records (and more concise telemetry streams). Perhaps this is something to do with “Options” now being a tab page rather than a dialog box? You need to set privacy.trackingprotection.ui.enabled to true to display the switch in the options. Word of warning: I wasn’t completely convinced by Disconnect in the past. Uninstalled a while ago but it didn’t turn off privacy.trackingprotection.enabled. I have been tearing my hair out by Amazon taking 30+ seconds to load and freezing Ff. I unabled the setting. Problem gone. Loads in 1 second now. @scott Hmm workaround rather than solve. In ublock (click header for console) myfilters tab, add this line and apply. Thanks, that speeds it up & stops the freezing… but like you said, at the expense of several other features, like hover-zoom for product images, and selecting other available images for products. What the hell causes the problem in the first place? I tried viewing Amazon with ublock, Privacy Badger, and No Script disabled, but Amazon is still slow & freezes. Am I right in the assumption that NoScript users don’t need to enable this option? Mostly yes. If you enable a domain in NoScript, trackers are loaded from it. With tracking protection, it would still block them. With this is EFF’s Privacy Badger extension redundant or does it provide additional protection? Yeah I use Privacy Badger too. Doesn’t it do the same thing?. It is somewhat confusing with all these tracker blockung add-ons. What is the best option?. PS I also use No Script. But that has nothing to do with trackers only with Java script. Firefox Tracking Protection does the exact same thing than EFF’s Privacy badger. 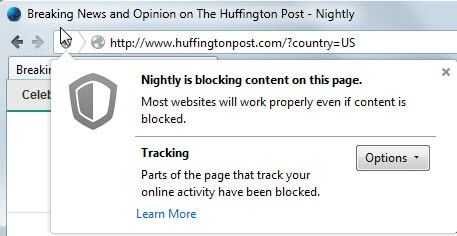 Their inner workings are different but the end result is the same: it will block the vast majority of web trackers. Privacy Badger has more features, but then Firefox Tracking Protection is lighter on ressources. I guess we can thank Mozilla for taking care of our privacy. Other browsers may still need third-party addons though, so I don’t think PB or Disconnect are redundant. The more choices we have, the better. I always heard addons like AdBlock Plus and Ghostery increase privacy at the cost of slower loading times, because they have to check each site against a huge blacklist every time it loads. Supposedly, the only way to increase privacy *and* speed is to use a HOSTS file or non-browser solution, like AdMuncher. But now Firefox has come up with an in-browser option that *doesn’t* result in a huge drain on memory/CPU/page loading time? It is not possible. When I disable AdBlockPlus, loading times on tracking heavy site increases three-folds. And I have this Tracking Protection enabled. To my knowledge this feature was not mandatory, just a suggestion for tracking hosts. If this is mandatory now, it does not work. I see tons of tracking files loading just by looking at Fiddler log or watching bottom of the page. I actually will disable Tracking Protection since it seems to be redundant with adblocker installed and probably only slowing page load. One other problem with it, you can not manually whitelist scripts/cookies. And many site require whitelisting of tracking scripts for them to work properly. That is true to an extent I think. If you had a ideal clean page with no tracking scripts or ads, then Firefox vanilla would load it faster than Firefox with ABP, exactly b/c the requests need to go through the filters. However, that is strictly hypothetical b/c modern websites have all kinds of third party scripts like tracking, ads, analytics and so on. Thus 90 percent of the time or more, it is faster if you have ABP on or some similar addon. Host files are probably faster, even though some people say that there are problems, like how host files are by nature more indiscriminate on what they block and also the fact that host files weren’t originally designed to be used that way with all those entries. I use host files on my android phone and it works well enough, but I wouldn’t use it on my desktop b/c I noticed that the indiscriminate blocking breaks some websites. Also you need to fully restart your phone/pc for any host/filter updates to take effect. Admuncher and the like have problems with the fact that they can only block http traffic or unencrypted traffic. There are some non browser solutions that also block https or encrypted traffic but they involve using or inserting that application web certificate in between the encrypted traffic which may be security issue. So I think adblocking addons probably the best of the imperfect solutions. One thing about ABP or any other type of filter addon is that it does increase memory overhead thus in the long run slow down a browser. Google “ABP memory usage” and read Firefox engineer’s Nethercote blog on it to see what happens. Some things have changed since then, but I don’t know how much. I personally think ABP is worth it. “If you had a ideal clean page with no tracking scripts or ads, then Firefox vanilla would load it faster than Firefox with ABP” Your hypothesis sounds logical but… i have yet to see it in my experience. Most websites that I see use 12-24 trackers (a few use a lot more) and make 200-300 URL requests. One of the cleanest pages that I know of is Startpage.com (search engine that I use) with 10 URL requests, all of them from Startpage and zero trackers. With uBlock and Ghostery enabled the page (Startpage) load times I saw were on average 10-15ms faster. Easylist blocked one of the URL requests for a script. Not a lot of difference in page load time but definitely not slower. To be honest I’ve never seen an instance where a website loaded faster because an adblocker wasn’t being used. I would be willing to say that 99.9% of the time an adblocker will substantially improve load times of an average website, quite often much more than what is stated in the research paper. On some webpages I’ve seen data usage drop by 50 – 70%, numbers like that are fairly common. Hosts files can be a good option but they will take some work. The hosts file I have I use on my mobile devices and my computers. I’ve also installed it on some of the computers I’ve cleaned with good results, so far. ;) The file has 15,000 entries and is only 312KB in size. If you’ve never used it there is a portable windows app called HostsMan which works very well to clean, optimize and check for duplicate entries. I think I have it set to put 8 entries on each line. Network latency is around 14ms so everything is working well. I also never have to reboot my computer when updating a hosts file on computers, mobile devices I reboot. On computers I can just open a command prompt and ipconfig /flushdns and then clear the browser cache. Or…cheat and use CCleaner to clear both. I think the amount of memory being used might need to be a concern but it depends on the number of tabs open, addons used and the amount of system memory. A lot of tabs open, more memory is going to be used, even without any addons installed. As an example I just saw in FF with 10 tabs open and no addons, 330MB of memory used. With uBlock, Ghostery and 17 other addons memory used was 395MB. Swapping uBlock with ABP memory used went up to 530MB. All numbers are rough averages. Of course streaming video and having a bunch of tabs open the memory used will be even higher, probably much higher. So unless someone has dozens of tabs open and maybe 3GB or less system memory using addons shouldn’t be a problem. I’ve used ABP for years and it works great but moved to uBlock because it uses less memory, not because ABP memory use was a problem “for me” but because using less system resources to accomplish the same job is always a good thing. is this another great feature/add-on that breaks every site you visit? It surely won’t break every site, or even many sites, but several month’s experience with Privacy Badger shows me that some sites won’t dish out content or allow commenting if you are using it. I don’t see a reason that the built in blocker would be different but I will check that out the next time I find a site doing that. A few of the newer add-ons and tweaks were stopping a lot sites from working unless I went in and tweaked them to work. Either I’m just getting lazy or I want the web to work to easy. I’ve even gone back to adblock+ w/ element hider and removed ublock, bluehell, and all the other’s. thanks Don, glad to know it wasn’t just me. Do i need this if i have all lists checked within uBlock? I think uBlock with the correct filter lists is much better than this feature and others addons. Thank Martin for the info. Running Firefox ESR 31.7.0, I find that about:config does not contain this entry: privacy.trackingprotection.enabled. When I enabled privacy.trackingprotection.enabled as true googlemail became completely disabled. It was impossible to load anything (completely white screen). It seems quiete dangerous to me. May be to do with ongoing development. It still isn’t switched on by default on v.38. I found this option in about:config in Waterfox & Cyberfox, but not in Palemoon v. 25.4.1 (64-bit). So, is there a way to get the UI switch enabled for easy access in Options? That’s because Pale Moon is based upon Firefox 24 code, whereas this feature was introduced around Firefox 33 or 34.